The "target for tonight", April 8th, 1942, was Hamburg – a most important industrial center to Hitler's war effort. Five hundred aircraft were to take part, among them 13 Wellingtons from the RCAF's 419 Moose Squadron based at Mildenhall in County Suffolk. It was the biggest and most ambitious night raid yet planned in the war and my second mission. I had been on only one previous raid since I joined the squadron two months earlier – an attack on Le Havre on April 5th. Our Wellington X.3467 had dropped fourteen 250lb bombs just north-west of the Bassin de Marie and inner port. Only one bomb dropped safe due presumably due to a mechanical defect. We then returned to base after a 4.5 hour round trip flight without incident. If I could survive the rest of the year I'd be able to celebrate my 21st birthday the night before New Year's Eve. April 1942 was an unusually busy month, which saw 419 assist in 28 operations, the squadron's efforts were apportioned among Ruhr–Rhine centres, ports in France and Germany, and mining. A foray on one of these ports–Hamburg (8/9 April)–was the prelude to one of the war's more remarkable escapes, a feat, which by virtue of its perpetrator's persistence and tenacity of purpose, deserves to be told at length. The featured performer was navigator, P/O Hubert Brooks, the first member of 419 Squadron to escape from captivity. In addition to Reference 1.23 in Appendix B, Dan Logan has developed an interesting web site dedicated to the RCAF 419 Squadron. 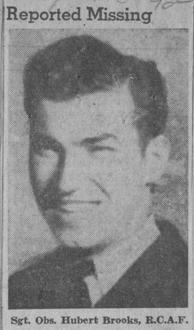 There is a page dedicated to Hubert Brooks and a separate awards page where his miltary awards are described and his 2 missions can be found in the APRIL 1942 Air Crews section. On April 8th, 1942 I was to go out on my second raid. 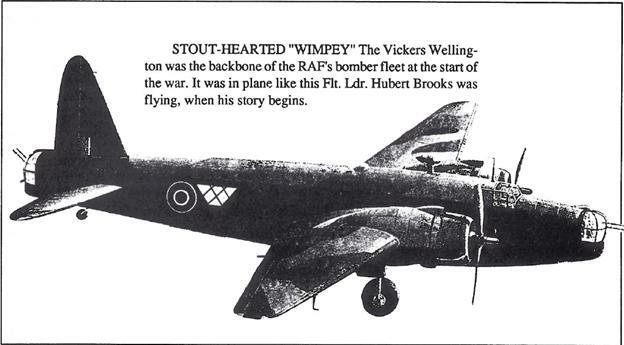 Our Wellington X3467 Wimpey, N for Nuts, was slated No.2 for take-off but at the last minute the skipper discovered one of his flight instruments was unserviceable. By the time it was fixed, we were No. 13 for take–off. The crew felt ill at ease. In times of war and the beginning of a mission, nervousness and uncertainty plague the courage of the boldest and everyone thinks too much and superstitions surface. Number thirteen, this smelt of disaster! We roared down the runway about 2200 hours. We were to find out that indeed it was our unlucky night. F/Sgt. PARKER R60366 Front Gunner Midnapore, Alta. As I lay in the nose readying my bomb sights for the run into Hamburg, I heard the front gunner call the skipper over the intercom: "Starboard engine's on fire!" The port engine caught fire a moment later after I had jettisoned our bomb load and gave the pilot a course for home. At first we thought the extinguishers had stopped the fires and we would make it at least to the North Sea, hopefully to the Frisian Islands, but both engines burst into flames again. I estimated we were close to the Dutch border when the skipper ordered us to bale out just after 1 AM. "Let me land on the right side of the border. Let me land in Holland, not Germany!" My mother received the following letter from the Department of National Defence followed by a number of brief news articles in the local papers (the Montreal Star and others). 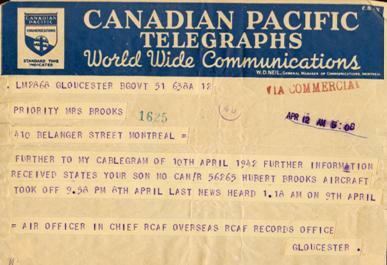 Son of Mr. and Mrs. A. J. Brooks, of 410 Belanger Street, Montreal. 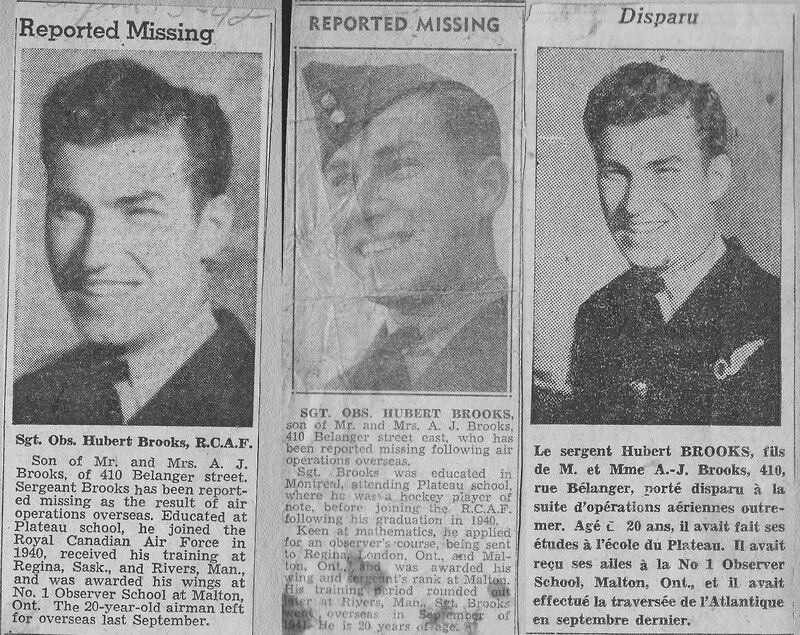 Sergeant Brooks has been reported missing as the result of air operations overseas. Sgt. Brooks was born in Peace River town of Bluesky Alberta on Dec 29, 1921. 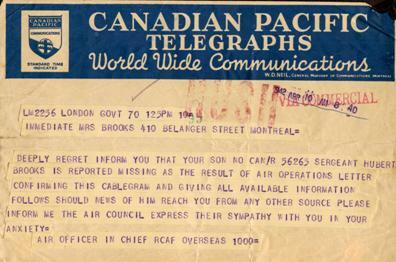 The family then moved to Ottawa for eight years and left Ottawa when Brooks was 12. While in Ottawa he went to Sacred Heart School in the west end. Brooks was then educated in Montreal attending first St. Nicolas Public School and then Plateau Academy where he was a hockey player of note. Five years after arriving in Montreal, he tried to enlist in the RCAF at 17, but it was not until August 1940 that he made it. Keen at mathematics, he applied for an observer's course, being sent to Regina Sask. ; London Ont; and Malton, Ont. He was awarded his wings and sergeant's rank at No. 1 Observer School at Malton. His training period rounded out at Rivers, Man. 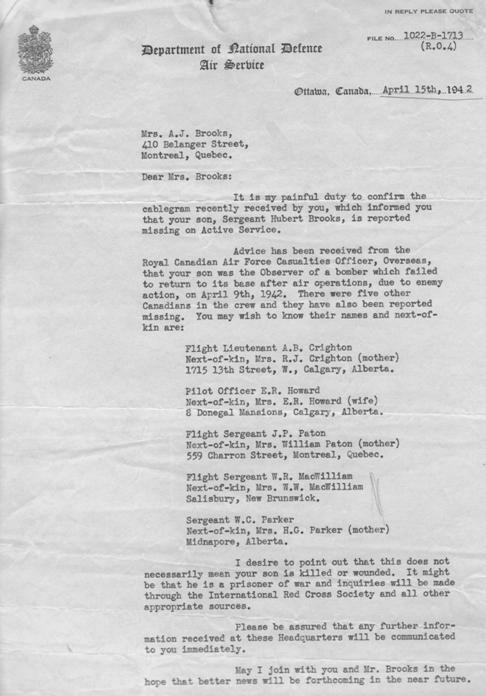 Sgt Brooks went overseas in September of 1941. He is 20 years of age. DETAILS (Numbers following a name are Military Service numbers): Abandoned, following fires in both engines, and crashed 0132 on marshy ground between Roggenburg and Barssel, 11¼ miles south-east of Leer. P/O Howard buried in the Sage War Cemetery. F/S Brooks was later decorated with the MC after escaping from captivity. Crighton was a Licentiate of the Royal Schools of Music in Calgary, Alberta and noted as being the driving force behind organising live music at Stalag Luft III, Sagan. AIR20/2336 identifies two RCAF officers with the same PoW number; F/L J M S Crighton, and F/L A B Crighton, both at Sagan. 1 In The Shadow of the Wooden Horse. (ISBN 978-0-9564112-0-4). Author: WILSON, TOM. Page no 42. 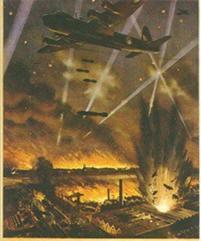 This is the Art Crighton mentioned as being a room-mate of the author when he arrived at Stalag Luft III, Sagan. 2 In The Shadow of the Wooden Horse. (ISBN 978-0-9564112-0-4). Author: WILSON, TOM. Page no 60. Author describes Crighton as the orchestra conductor, a music graduate who worked for Boosey & Hawkes in Canada. "Art conducted the camp orchestra in the East Camp but was then moved over to the North Camp. I also attended his lectures on Harmony and counterpoint. He was a very valuable member of the camp. The orchestra also provided incidental music for plays, reviews and pantomimes." 4 The Great Escape: A Canadian Story. (ISBN 978-1-77102-272-9). Author:Barris, Ted. Page no 6. Crighton mentioned being an extrovert. 5 The Great Escape: A Canadian Story. (ISBN 978-1-77102-272-9). Author:Barris, Ted. Page no 81. Crighton noted as constructing a 9 hole 'golf course' at Stalag Luft III, Sagan, using clubs sent from the YMCA and making home made golf balls. 6 The Great Escape: A Canadian Story. (ISBN 978-1-77102-272-9). Author:Barris, Ted. Page no 130. Crighton noted as leader of the Stalag Luft III, Sagan orchestra. 7 The Great Escape: A Canadian Story. (ISBN 978-1-77102-272-9). Author:Barris, Ted. Page no 176. Photo of Crighton in uniform, conducting the orchestra. 8 The Great Escape: A Canadian Story. (ISBN 978-1-77102-272-9). Author:Barris, Ted. Page no 204. Crighton played 'the Last Post' on his trumpet at the dedication to the Memorial at Stalag Luft III, Sagan. 2) Art Crighton 1917 – 2013 or cached Art Crighton 1917 – 2013 Cached ... interesting note: The GREAT ESCAPE occured in March 1944. Only three Airmen ever made it to freedom. The rest were captured. Fifty were then executed on Hitler’s orders. Urns containing their ashes were brought to the Sagan POW camp where a funeral service was held. It was Art Crighton who played the Last Post. Comment: Serial Range X3445 - X3489. 45 Wellington Mk.111. Part of a batch of 500 Wellington Mk.1C/111. X3160-X3179; X3192-X3221 (50) Mk.1C delivered by Vickers (Squires Gate) between Aug40 and Jun41. Airborne from Mildenhall. Abandoned, following fires in both engines, and crashed 0132 9Apr42 on marshy ground between Roggenburg and Barssel, 18 km SE of Leer. 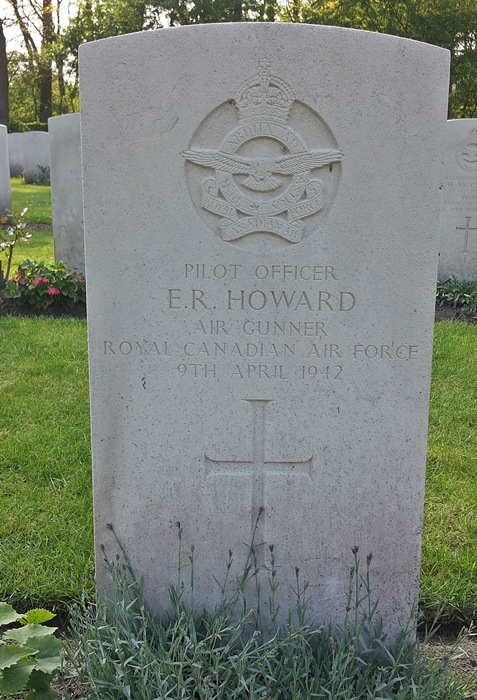 P/O Howard RCAF is buried in Sage War Cemetery Oldenburg, Land Niedersachsen Germany. F/S Brooks was awarded a Military Medal after escaping from captivity. AIR20/2336 identifies two RCAF officers with the same PoW number; F/L J.M.S.Crichton and F/L A.B.Crighton, both being held at Stalag Luft 111, Sagan. F/O A.B.Crighton in Camp L3, PoW No.113. F/S W.R.MacWilliam in Camps 8B/344,PoW No.24837 with F/S W.C.Parker, PoW No.24826 and F/S J.P.Paton, PoW No.24824.